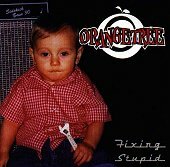 Former MU330 vocalist Jason Nelson is back with another ska-punk act, Orangetree. This St. Louis six-piece plays typical slaphappy ska-punk with plenty of pop and humor to go 'round. Their debut is worth a few laughs, but beyond that, it loses momentum. "Alligator" and "Pretzels" are both worth a few giggles while "Chop Top" and "Soda" will put a smile on your face; underneath the semi-serious surface their is more humor and smiles to be found. The band is definitely a party-time fun band worth a few listens, because they will get you dancing and smiling. Depth, though, is lacking. It's just typical, goofy ska-punk madness as the band goes wild to get their audience to go wild. The band isn't the tightest, but it is evident they're having a blast. So, it's safe to say, you will too. If you're looking for something that will give you a quick sugar rush and wear off soon after, then this is something you should take notice of. If it's a long lasting record, then forget it. I'll give it a C-.